The world record for the most expensive bottle of wine sold at auction was smashed twice when two bottles of 1945 Romanee Conti fetched US$ 558.000 and US$ 496.000 respectively. Last week, Liv-ex announced that the total amount of bids and offers on their trading platform had reached an all-time high of over £50m. Transactions ramped up considerably in 2008 when reduced import duty on fine wine in Hong Kong released the handcuffs of Chinese importers. At the peak of the market June 2011, trading had reached £20 million, with Bordeaux being the dominant element. The subsequent enlargement of the market to Italian and American wines, among others, was the result of the correction in the Bordeaux market at that time. In the run up to 2016, volumes remained static around £20m, but the complexity of the market changed significantly. It’s in the last 30 months that the figure has risen considerably to this new record level, in the wake of the trend for Bordeaux and Burgundy wines, prices for which have been rising steadily. After recording the worst monthly performance for Bordeaux (56.4%) in September, Bordeaux’s market share is on the rise again. The region showed signs of better health in October (62.4%) and even more recently this week with 67.8% of the market share by value. The First Growths strongly contributed to this, representing 27.7% of the total activity. This trend is due to the increased interest of critics in the region at this time, as the Bordeaux 2016’s start to be re-tasted in bottle, with updated reports from both James Suckling and Neal Martin being published recently. 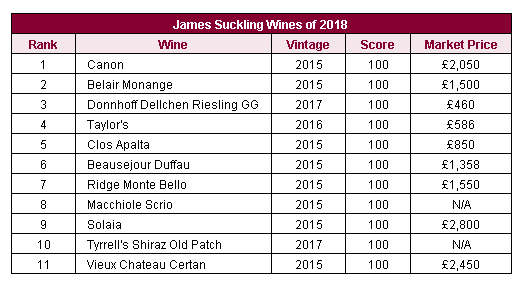 Suckling awarded 11 wines a perfect 100-point score, but named Canon 2015 as his ‘wine of the year’. The critic said that it was his “favourite perfect wine of the 2015 vintage” and the “wine of a lifetime”. In his tasting note, Suckling described Canon 2015 as “seductive”and “perfect”. He also noted its “silky and deep, ribbon-like finish”. Overall, Suckling said that “Bordeaux dominated the list with almost two dozen wines and rightly so considering the greatness of the 2015”. He went on to say that this year’s list “has so many exceptional wines”, and, “they are wines that all of us dream about drinking again and enjoying a moment with family and friends to taste and savour their greatness”. The International Wine Challenge (IWC), carried out at the Oval in London, is now in its 36th year. The IWC is accepted as one of the world’s finest and most meticulously judged wine competitions, which assesses every wine blind and judges each for its faithfulness to style, region and vintage. Wineries all over the World enter their wines with the hopes of winning a coveted medal, with wines being entered from all classes and categories, from simple Vin de Table and wines from far flung regions such as Thailand, to vintage Champagne and Grand Cru Classé Bordeaux. 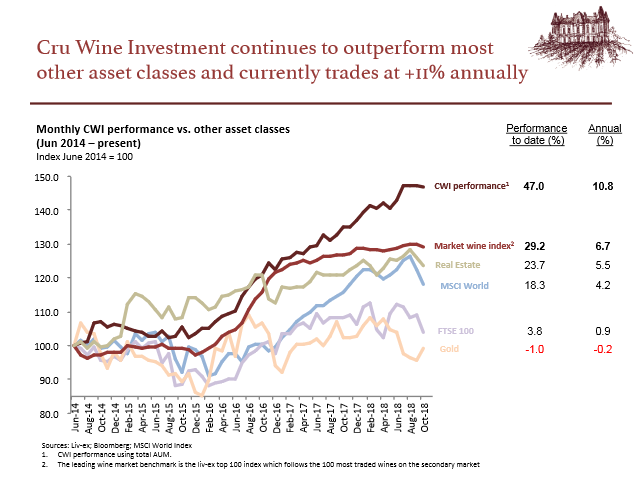 Our performance on behalf of our clients remains strong 10.8% year-to-date, outperforming the market index and most other asset classes. We are delighted to invite you to an evening of wine tasting on Wednesday 21st November, 6pm, at Varana in London’s Mayfair. Together with our friends at luxury jewelers Damiani and fashion store Varana, it promises to be a very special event. If you would like to attend, please let us know on info@cruwineinvestment.com. We will serve some excellent fine wines together with canapés. Cru Wine Investment continues to innovate – we launched our online shop in June, and invite you to explore the range. If you would like to speak with one of us or receive more information in regards to starting your own wine portfolio, just fill in this form, and we’ll get in touch.